The watch repair industry has few technicians qualified to repair outside of the Swiss service centers. Govberg Watch Repair fills this gap with highly trained and certified watchmakers. Our watchmakers have trained with some of the most prestigious Swiss watch manufacturers in the world. By adopting Swiss standards we are able to provide the highest quality repairs for our customers on a great range of products. See the complete list of brands serviced and services offered. Govberg Watch Repairs maintains state-of-the-art and secure repair facilities, with an ample workstation maintained above our store in the Philadelphia suburbs and a comprehensive off-site repair center. Our arsenal of equipment and specialized tools is constantly updated to ensure proper service for an ever-expanding list of watch brands, featuring the newest technologies and horological innovations. Govberg also houses an extensive inventory of spare parts for modern, vintage and specialty timepieces, which encourage the repair and restoration of your timepiece back to its factory specifications. We’re trusted – Govberg Watch Repair has been servicing fine timepieces since 1922. We are accredited with the Better Business Bureau with an A+ ratingand are members of the American Watchmakers-Clockmakers Institute (AWCI) and the National Association of Watch & Clock Collectors (NAWCC). Our customers love us (see our testimonials here). We only use watchmakers with the highest training and accreditation from the luxury brands that we service. Most local jewelry stores do not have in house watchmakers and you cannot be sure of the quality of the technicians they are using. With us, all repairs come with a 1 year Govberg Jeweler’s Warranty. We’re convenient – You don’t have to travel to the store during its limited operating hours to drop off or pick up your watch. Once your watch is repaired, we’ll ship your watch right back to your home or office in the continental US, fully insured via Fedex – for FREE. Choose Govberg Watch Repair, because every second counts. Questions? Check our our Frequently Asked Questions page for more info. 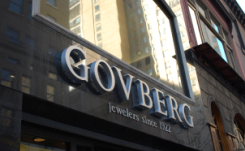 The Govberg Jewelers legacy began in 1922, when young watchmaker and diamond expert Albert Govberg opened a specialty, family-run jewelry store along Philadelphia’s historic Jewelers Row. Over 90 years later, Govberg Jewelers is celebrated as a true Philadelphia icon, committed to bringing exquisite and exclusive wares to the people of a city rich in history and tradition. Under the dynamic leadership of Albert’s grandson Danny Govberg, the seasoned jeweler has garnered a reputation far beyond the Philadelphia city limits for its outstanding selection of fine timepieces, its knowledgeable staff and celebrated repair facilities. Visit www.govbergwatches.com to learn more about the complete Govberg experience. Interested in selling or trading your watch? Govberg Jewelers pays the highest prices in the industry for pre-owned watches. The process is quick and simple. Click here to fill out the form and receive a quote on your watch.